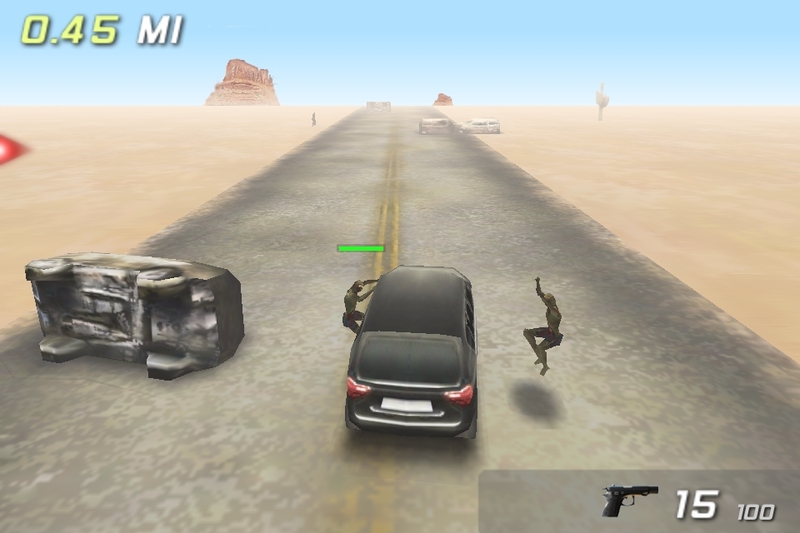 Zombie Highway is the latest in the App Store’s seemingly endless supply of zombie-themed endurance games. As the name suggests, the goal is to drive your vehicle down a long stretch of abandoned roadway as far as possible, whilst avoiding obstacles as well as a constant barrage of amazingly athletic zombies leaping onto your car, trying to topple it over. The game’s controls involve a mixture of both tilting and tapping. Steer your car using (quite responsive) tilt controls, swerving left and right to avoid road hazards. Should some of the brain-hungry undead manage to attach themselves to the side of your vehicle, you can attempt to side-swipe the road debris to force the leech like undead bastards off, but be careful not to get too close otherwise you may crash your car. Although, the game seems to be very forgiving in this aspect. There are supposedly 7 different types of zombies, each with their own characteristics, but to be honest, I noticed very little difference between them. You also have an unlockable arsenal of 8 different guns at your disposal, which the (unseen) person in the back of your car uses to shoot the zombies. The guns vary in speed and power, and include handguns, shotguns, and automatic weapons. 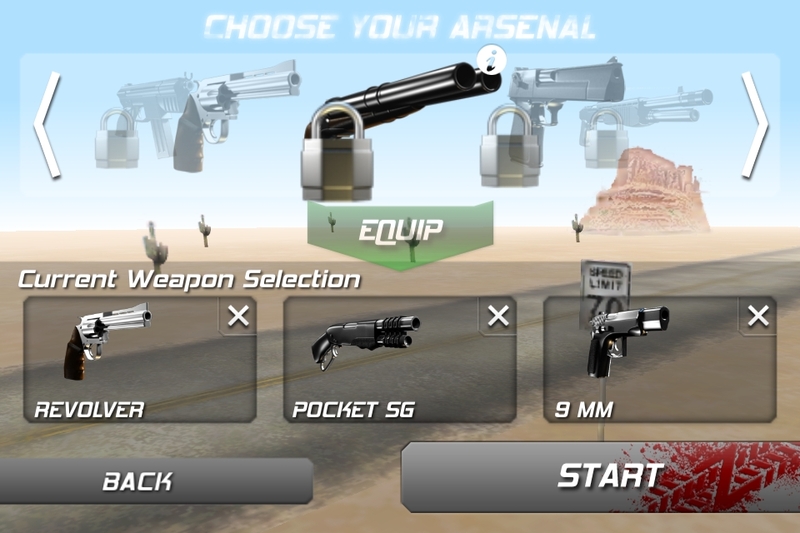 Before starting a game you can select which three of your unlocked weapons to use. Only one weapon is active at any given time, but should you run out of bullets, you can easily swap out weapons at anytime. To fire you simply tap on the arrows on the far sides of the screen which correspond to the zombies who are currently latched onto your car. Each zombie has its own power-level meter which indicates how close they are to being defeated and thus knocked off. The first thing iPhone 4 (and 4th gen iPod Touch) users will notice is the crisp clean Retina resolution graphics.This game does look truly fantastic.Unfortunately the other thing that is quickly apparent is that there is no soundtrack whatsoever. In fact you cannot even listen to your own music while playing the game. Granted the game does sport some nice sound effects for the guns, vehicle and zombies, but the lack of music (whether developer or user supplied) is a big disappointment. For whatever reason developer Renderpaz chose to use Facebook for global high scores (based on distance traveled). Personally I would have preferred something a bit more iDevice-specific like OpenFeint or even Game Center, since despite having a large number of Facebook Friends, I seem to be the only one that owns this game. Zombie Highway is a visually appealing game which is fun in short bursts, but like the unfortunate undead attacking my car, I don’t see it hanging onto my device for long. NOTE: This review previously appeared on Games Uncovered.